Congress before committing military forces to a war or armed conflict. War Powers. Article I, Section 8, Clause 11 of the U.S. Constitution grants Congress the power to declare war. from Article II, Section 2, which names the President Commander-in-Chief of the armed forces. 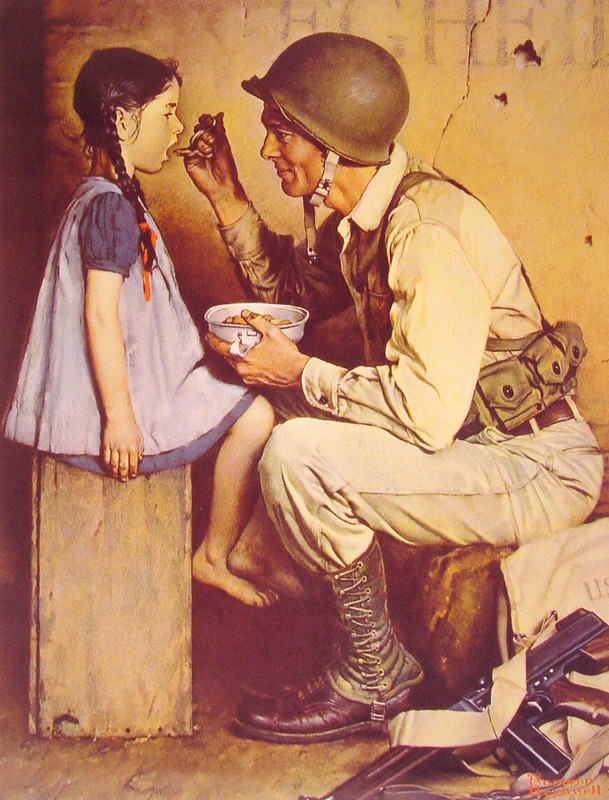 Norman Rockwell "The American Way"
the samurai-caste, who observed strict rules about honor and combat. Mayaguez Incident was the last official battle of the Vietnam War. The seminal text in the field of play studies is the book Homo Ludens (Wikipedia) (Full Text Here PDF) first published in 1944 by Johan Huizinga who was a Dutch historian and one of the founders of modern cultural history. Starting on page 89 (PDF says 94) is a section on Play and War. "The two ideas often seem to blend absolutely in the archaic mind. Indeed, all fighting that is bound by rules bears the fo rmal characteristics of play by that very limitation." Scholars have determined that the concepts of "religious war", "holy war", and terminology such as "enemies of God" were conceived by Christians in the 11th century Crusades. Notion of a "religious war" as opposed to a "secular war" is the result of the Western concept of the Separation of Church and State. meaning "Whoever utters, shall be fulfilled." is part of the traditional greeting used by the followers of the Sikh religion and a call to action or duty. to communication with a drum which authorities restricted. the losses due to troops deserting battle were regularly greater than the losses resulting from combat. The shortest war in history was the Anglo-Zanzibar War. It lasted just 38 minutes.